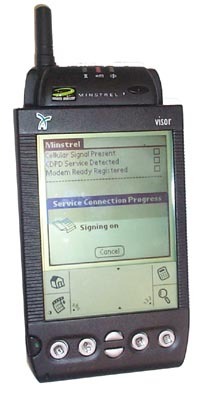 Handspring Visor owners will within the next few months go from having zero wireless options to a plethora of wireless solutions. At PC Expo, we counted four companies that have wireless products in development: Novatel, Omnisky, GoAmerica, and ActiveLink. Interesting to note is that most of the solutions are based on Novatel Wireless' Minstrel S Springboard module, with products geared to both the consumer and the enterprise markets. The Minstrel S from Novatel Wireless enables 2-way wireless access to the Internet using Cellular Digital Packet Data (CDPD) technology - a secure open standard - with real-time data transmission at speeds up to 19.2 kbps. The Minstrel supports popular Palm OS applications and synchronization programs, and will have the AvantGo web browser and OneTouch email client bundled with the unit. While not bulky, the unit is larger than most existing Springboards, adding 1/3" in thickness, ¾" in length, and about 4 oz to the Visor. The Minstrel S comes with its own internal rechargeable Lithium Ion battery and a fast charger. The battery contains enough juice for eight hours of active use, and 24 hours of standby time. Three LED indicators at the top of the unit show battery strength, incoming e-mail, and system service. Shipping this fall at an expected price of $369, the Minstrel S is one of the most expensive Springboard unit announced to date. However, the cost of the unit could vary depending on whose service you purchase with it. Novatel currently bundles Internet service from AT&T Wireless, Bell Atlantic Mobile or GoAmerica with their Minstrel modems. Monthly service charges for unlimited usage should be in the $40 - $60 range. In addition, the Minstrel S will also be available with 2 MB and 4 MB flash memory versions.